For the second year in a row, Joe Pulizzi at the Content Marketing Institute and Ann Handley of MarketingProfs have issued a report on B2B content marketing trends. The report is based on a healthy 1,092 responses to an email survey. Participants come equally from small and large companies, and most have the job title of CEO, Senior Executive, or Marketing Executive. Only 18% cite an insufficient budget as their biggest challenge. The money is available; the hard part is finding a steady supply of engaging content. In the most revealing portion of the report, Handley and Pulizzi ask content marketers which tools are most effective (see chart). In-person presentations top the list, followed by webinars, case studies, video, e-newsletters, white papers, and blogging. The perceived effectiveness of blogs is up 45% from the 2010 survey — a reflection on the Panda/Farmer algorithm shift at Google and the increasing value of quality content. Though social media is still considered the least effective of the top tactics, just as it was in 2010, half of this year’s respondents think it is effective. You read that correctly: Half of the content marketers polled doubt the effectiveness of social media. Yet, earlier in the report, the authors note that social media is the #2 technique used by content marketers, with 74% using it, second only to articles (79%) and just ahead of blogs (65%). Blog usage skyrocketed this year, from just over half of content marketers using blogs (51%) to nearly two-thirds (65%). The biggest losers in 2011 were print publications, declining by more than 10% in this survey. Another issue covered in the survey is measuring results. 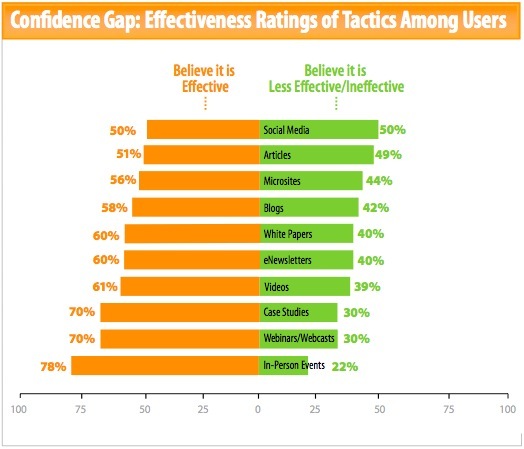 Sadly, 60% of content marketers rely on traffic as the main metric for determining effectiveness. Sales and search engine rank are down to 40% each. Measuring the value of content marketing requires tying traffic and sales (or leads) together and measuring other indicators of influence, such as how often the content is quoted or cited. Putting too much emphasis on traffic can lead to traffic-boosting stunts such as name-dropping. Surely we can find a better way to measure influence. Thanks to Joe Pulizzi at the Content Marketing Institute and Ann Handley at MarketingProfs for putting this survey together and making the results so readily available at no charge. Source: “2012 B2B Content Marketing Benchmarks, Budgets and Trends,” Content Marketing Institute and MarketingProfs, Dec. 5, 2011. Image from “2012 B2B Content Marketing Benchmarks,” used under Fair Use: Commentary. Steve O’Keefe is co-founder and Chief Operating Officer of SixEstate Communications. He has taught Internet PR since 1994 for Tulane University, Stanford University, UCLA Extension, Publishers University, and the PRSA, among others. Steve wrote the bestselling book “Publicity on the Internet” in 1996.